These days I am travelling a lot between different offices for my job. The other day when I went from one office to another which was around 10 minutes’ drive, I realised that I had lost my employee ID and security pass. I was panicking when one of my colleague emailed to let me know that someone had found the ID and handed it back.I was happy and relieved to know that. Anyway I returned to the office and parked the car. As soon as I got out of the car, one of the tradesmen who was working on one of the building nearby came and said, “You are M right? We found the pass and gave it to the office.” I was thankful and thanked him and walked passed. I thanked him again and walked literally for a second, there was 3rd and 4th guys telling me the same thing. Have you lost and found something important? Do share your story. 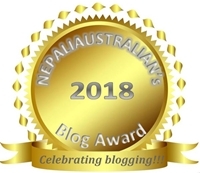 This entry was posted in Personal and tagged Australia, australian, australian nepali, lost and found, M from nepaliaustralian, Nepal, Nepalese, Nepali, nepali australian, Nepali blog, Nepaliaustralian. Bookmark the permalink. I have had my purse stolen twice and had to replace driver’s license, credit cards and insurance cards. Once I was right there (at library) when it was taken, other time close by and they had to get in my car while I was talking to somebody! Neither criminal had to pay Me back! Just their lawyers who got them community service and slap on hand! Grrrr! it made me upset! Take care and it now is a little embarassing passing all those who helped or knew about the ID badge and key card. Try to look down and maybe they will give you peace and respect. (?) My suggestion anyway. hugs xo kiss for Chhori, dear. Ohoo that is so bad that they didn’t get punished. I wonder sometimes how legal system works.